It’s Homecoming! The time of year where everyone comes together to share their Spartan Pride. The city of East Lansing bleeds green through the week as all Spartans old and new celebrate the Homecoming festivities. This year the theme is: “Celebrating Unwavering Courage”. Paying homage to those that have boldly raised their voices and led the way to a better world. 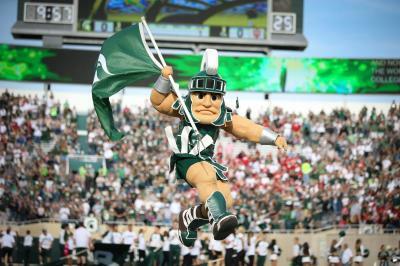 Bring your Sparty out at this year’s Homecoming October 1 – 6! Spartan nation is thriving! Students, friends, alumni, and the Grand Marshall Ernest Green are returning to watch MSU Spartans take on the Northwestern Wildcats! The continuous tradition of, "Glow Green" is happening again this year! Show your pride, by swapping out all your outside lights, or any lights that glow with a green bulb during Homecoming week. Don’t forget to take photos of your green “glow” and tag #GlowGreen to be entered into the Glow Green Photo Contest! All entries will be entered to win one of three prizes! Here is a list of some of the event highlights for the week. The complete list can be found on homecoming.msu.edu. Sample 10 different delicious flavors of the famous MSU Dairy Store ice cream. Sit back, relax and enjoy a night full of a cappella music from MSU groups. Or grab the mic and sing your heart out. Learn how Ernest Green became a major figure in the civil rights movement and enjoy MSU Bakers cookies. Head on down to Dem Hall and participate in a friendly walking competition between Michigan State University and other Exercise is Medicine on Campus Universities. The challenge will consist of walking laps on the sidewalk around this field (approximately ¼ mile) throughout the day. This event is open to faculty, staff, students, and alumni and no registration is required. Start homecoming weekend off with a free brunch and a picture with the Spartan Statue. Join fellow Spartans and special MSU guests at this traditional Homecoming event. Admission is $40 per adult, $15 for children 12 and under, and includes brunch buffet. Special Guests will include: MSU Homecoming Court, Head Football Coach Mark Dantonio, Sparty, and many more! For more information, visit the Green and White Brunch Website. The MSU football team and Coach Mark Dantonio will take on the Wildcats of Northwestern University. Half-time will feature the Spartan Marching Band, the 2018 Homecoming Court, Homecoming Grand Marshal, and the MSU Homecoming Parade award winners. For ticket information, call (800) GO-STATE or visit msuspartans.com. For the latest Homecoming information, visit the official website at alumni.msu.edu. Follow along using #MSUHomecoming.